In the aftermath of the Pennsylvania attorney general’s shocking and disturbing grand jury report on child sexual abuse within the Catholic Church, the General Assembly will continue to take important steps to help protect victims and ensure they have both a voice and justice. The work to protect children continues. Earlier this session, the House passed Act 67 of 2017, which eliminates the sunset provision in the Crimes Code regarding issuance of administrative subpoenas in investigations involving child sexual exploitation or abuse; and Act 54 of 2018, which requires public and nonpublic schools, as well as hospitals, to display a poster with the statewide toll-free telephone number for reporting suspected child abuse or neglect (ChildLine). The House also passed House Bill 1527, which is currently in the Senate, to clarify that mandated reporters must report suspected child abuse whenever they personally witness an abusive act to an identifiable child. This fall, the House is expected to consider Senate Bill 261, which would eliminate the criminal statute of limitations for prosecutions of sexual abuse of minors, extend the civil statute of limitations for lawsuits alleging sexual abuse of minors until the victim reaches 50 years of age, waive sovereign and governmental immunity for claims and remove caps on damages against governmental parties sued for sexual abuse of minors. Currently, the statute of limitations for civil claims alleging sexual abuse of a minor is until the victim reaches age 30; and the statute of limitations for criminal prosecutions alleging sexual offenses against a minor is until the victim reaches age 50. It its current form, the bill would apply to future crimes only. Anyone who suspects a child may be abused or neglected is encouraged to call ChildLine at 1-800-932-0313. More information about child abuse is available at keepkidssafe.pa.gov. Those who have been affected by abuse stemming from the grand jury report are urged to visit attorneygeneral.gov/report for additional resources. Wherever I go in Pennsylvania, the one constant theme I hear is “When are you going to eliminate property taxes? The years roll by, but the General Assembly seems deaf to the cry of folks whose lives are being ripped apart by property taxes. I am a co-sponsor of House Bill 76, which would eliminate property taxes, and have introduced House Bill 2548 and House Bill 2065 to help with the school property tax problem. House Bill 2548 would institute mortgage foreclosure appraisal requirements in order to protect the value of residential real property for homeowners who face the possibility of losing their homes to a judicial sale or sheriff sale. My legislation would require any owner-occupied residential home that is subject to foreclosure to be appraised prior to its final disposition at a judicial sale or sheriff sale. The appraisal must be conducted by a real estate appraiser who is licensed or certified by the Pennsylvania State Board of Certified Real Estate Appraisers. House Bill 2065, the Property Tax Pension Obligation Disclosure Act, would require the governing body of each school district to calculate the amount of unfunded pension and other postemployment benefit obligations per $100,000 of assessed residential property within the school district. This would help provide prospective homeowners information on the financial solvency of their school district and allow them to make more informed decisions. I also came across the following article in the Times Leader newspaper. I wanted to share it with you here, because, while it is very disturbing to read how the process of funding our schools through property taxes is destroying our communities, it illustrates clearly why I continue to fight to eliminate this insidious levy. A mix of 2,545 residential and commercial properties are eligible for Luzerne County’s main annual first-stage delinquent real estate tax auction on Sept. 27, according to the county’s tax-claim office. Properties become eligible for auction if taxes have gone unpaid for two years. The list typically shrinks as the sale nears because property owners can prevent auctioning by paying the portion of taxes dating back two or more years — in this sale everything owed through 2016. Owners also can avoid the sale by complying with a repayment plan, filing for bankruptcy or convincing a judge that temporary removal from the list is warranted. Last week, I attended a joint House and Senate Veterans Affairs and Emergency Preparedness hearing on the status of first responders in the Commonwealth. To call our firefighter shortage and emergency services situation a “crisis” would be an understatement. This field meeting, which was held in Lewistown, continues the conversation about how to address problems facing the State Fire Academy in the Commonwealth. Our State Fire Academy is in severe need of financial support for enhanced training and equipment upgrades, as well as other resources, including staffing. It is absolutely essential that we discuss these deficiencies, as well as work together, in a bipartisan effort, for sound public policy solutions that will put the academy in a position to succeed. 1. Medicare and Medicaid reimbursement are not sufficient to cover the cost of ambulance services. 2. The number of false alarms and non-transport calls is alarming and costly. A non-transport call occurs when someone calls for an ambulance, is treated at the scene, and then refuses transport. 3. The shortage of volunteers had caused the number of volunteer firemen to drop from 350,000 over 30 years ago to under 50,000 today. 4. The cost of regulations, training, and equipment has far exceeded the inflation rate. The bottom line is that bills that have passed in the House or the Senate have not been acted on over the past 20 years and must be active on quickly. Our committee is working on Resolution 6 results to initiate the legislative relief immediately in the next term. 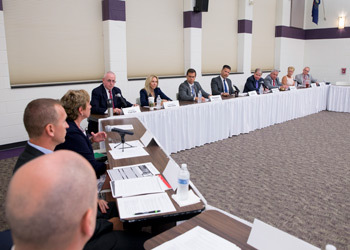 I attended a public roundtable meeting on School Safety at Cedar Crest High School earlier this month. 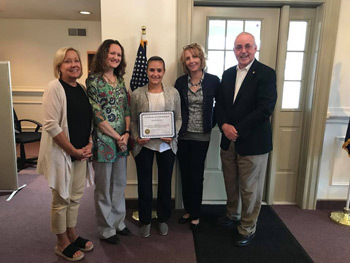 It was a great privilege this week to honor Brook Bartal, our intern, who completed her internship and is heading back to school next week. Brook hopes to go to the U.S. Air Force Academy and I know she will be successful and will be a tremendous officer. 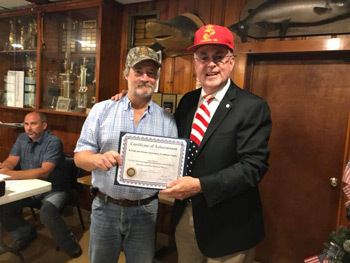 I was truly honored today to present a certificate of achievement to the R Field and Stream Club for its tremendous support of The Knights of Columbus food drive and in raising over $20,000 to assist those in need. Wonderful, wonderful emissaries of our community. Jon Wilson, Special Agent in Charge of the Drug Enforcement Administration’s (DEA) Philadelphia Field Division, this week announced that 5,456 drug-related overdose deaths were reported by coroners and medical examiners in Pennsylvania for 2017. This number represents a rate of 42 deaths per 100,000 people and a 64% increase in overdose deaths from 2015 to 2017. The DEA Philadelphia Field Division will be releasing a report entitled The Opioid Threat in Pennsylvania next month. This report was prepared in conjunction with the University of Pittsburgh School of Pharmacy’s Program Evaluation Research Unit, Pennsylvania Opioid Overdose Reduction Technical Assistance Center (TAC) and presents a comprehensive assessment of the opioid crisis in Pennsylvania through collection and analysis of supply and demand indicators and intelligence, as well as detailed county level analysis of multiple opioid misuse data sources. A summary of key findings from the upcoming report indicates that heroin sourced from Mexican transnational criminal organizations presents a persistent and pervasive drug threat in Pennsylvania, and that the heroin threat to Pennsylvania is exacerbated by the unprecedented proliferation of clandestinely-produced fentanyl and fentanyl-related substances. The presence of fentanyl was noted in more than 67 percent of drug-related overdose deaths in Pennsylvania in 2017; the presence of fentanyl-related substances in overdose deaths rose almost 400 percent from 2015 to 2017, with 17 distinct fentanyl-related substances detected in overdose deaths in 2017. Upon release, The Opioid Threat in Pennsylvania will provide a timely and actionable depiction of the opioid crisis in Pennsylvania. At a meeting this week at the Bedford County Airport, members of the House Transportation Committee learned more about ways in which drones are being used to enhance safety, emergency preparedness and transportation within the Commonwealth. Drones, which are pilotless, radio-controlled aircraft used for reconnaissance and routinely include cameras, are not only used by commercial enterprises and research entities but are growing in use by government agencies for emergency preparedness and response. 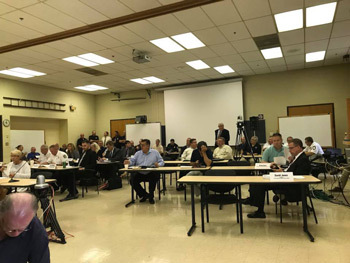 Testifying on their state government applications this week were officials from the Pennsylvania Turnpike Commission, Civil Air Patrol, Norfolk Southern Railroad, and Szanca Solutions and Eye In the Sky Unmanned Aerial Systems. Last session, the Joint State Government Commission conducted a study on drones, which included operations performed by state and local agencies. Additionally, the report enumerates the categories of use and current federal regulations. That report is available here. For families looking to plan for higher education, the Pennsylvania Treasury offers the PA 529 Guaranteed Savings Plan (GSP), in which growth is tied to the rate of college tuition inflation, and the PA 529 Investment Plan (IP), which offers 15 investment options by The Vanguard Group. Contributions to PA 529 plans are deductible from Pennsylvania income taxes, grow tax free, and, when used for qualified educational expenses, are federal and state tax exempt. Both plans provide flexibility to pay for higher education expenses at most higher education institutions across the country. The PA 529 GSP is designed to enable your savings to help keep pace with the rising costs of higher education. The PA 529 GSP contributions grow at the rate of tuition inflation but are subject to fees and premiums. The PA 529 Guaranteed Savings Plan (GSP) is offering free enrollment – a $50 savings – for all new accounts opened before Aug. 31, at PA529.com. Use code “SUMMERGSP” when prompted. The PA 529 Investment Plan (IP) features low fees and more than a dozen conservative and aggressive investment options. No enrollment fee is charged for the PA 529 IP. The Capitol tour office is now taking reservations for the 2019 spring season. The late spring and early summer seasons are the busiest time for Capitol tours. Dates fill up fast, so make your reservation as soon as possible. You can book your own Capitol tour by clicking here. Have your group name, total number of participants and best contact information ready. You are also welcome to visit the Capitol in small groups, including as single participants or individual families. Reservations are still recommended. Tours are available Monday through Friday, 8:30 a.m. to 4 p.m., and Saturday, Sunday and most holidays at 9 a.m., 11 a.m., 1 p.m. and 3 p.m. The Capitol is closed for tours New Year’s Day, Easter Sunday, Thanksgiving Day and Christmas Day. Weekday tours begin at the top of the hour and every half hour. The tours last between 30 and 45 minutes depending on the size of the group.